163/250 is a 2016 Treasure Hunt and 3/10 in the HW Daredevils series. 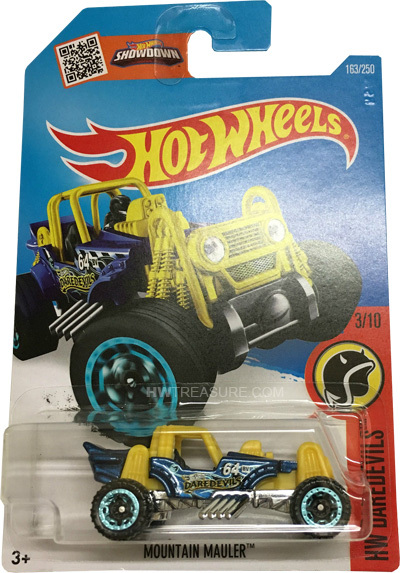 The Metalflake blue vehicle features a yellow roll cage, engine, and shocks. 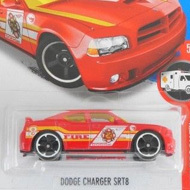 The sides are decorated with “Daredevils” in black & yellow, the Hot Wheels logo, “64”, “EV”, and the low production symbol. 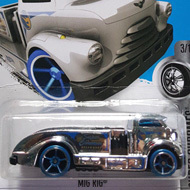 It has a black interior, Off-Road 6-Spoke wheels with blue rims, and a chrome plastic Malaysia base. The Mauler made its debut in the 2014 HW Off-Road series. It is a unique design that is perfect for off-road racing or a four-wheeling adventure.